Truck drivers prayer. Have you ever thought about a truck driver and what their life consists of? Do you ever wonder how hard it might be to work as a truck driver? For many, it means leaving their homes late in the evening to drive all through the night. It involves kissing their family goodbye knowing that they might not get a chance to see one another for at least a week or two. It means receiving a call in the “middle of the day” that your son or daughter has broken their leg on the playground at school. It means feeling like a part-time parent because you are several states away and can’t be there to nurture those you love most. It means being judged by family and friends because you are making a living to provide. With all these difficulties in mind, do you think that it is vital for truck drivers to pray? Well, it is no doubt crucial that truck drivers should pray. Look at all the situations that they have to face! Surely they need to draw strength from the Lord. The Bible says in Psalm 73:26: “My flesh and my heart fail, but God is the strength of my heart and portion forever”. If you are a truck driver and not really sure how to pray, please consider using this model of a truck drivers prayer to go by. Tonight I travel out on the road once more. Each time I leave my heart stays home with my family. I ask that you protect my family while I am not there. You are our Great Provider. I also ask that you keep me safe through long working hours and driving long distances. Help me get adequate rest at night, so I will be refreshed to travel. Most importantly, keep me close to you at all times. Lord, I am just a person, but please hear this truck drivers prayer. Truck drivers should pray because they want to. It is how they communicate with God, and God wants to hear from them just like he does anyone else. 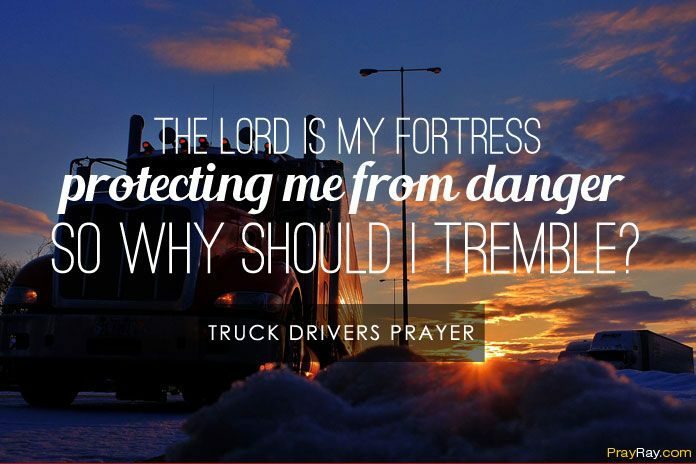 Praying can keep truck drivers from many dangers that they face on the road. The Bible says in Psalm 27:1: “The Lord is my light and my salvation; so why should I be afraid? The Lord is my fortress, protecting me from danger, so why should I tremble?”. If you just prayed may God bless your leaving out and coming in! May He wrap angel wings around your truck as you leave out and pull in. Please understand that you are valued, and God always honors a truck drivers prayer. Keep praying those prayers! You may feel alone on the road, but you are never alone. God is with you. Thank you for your service. Without your deliveries, this world would not be able to operate!